I felt slightly chastened, because I saw potential there. He saw a cliché. Maybe I had to explain myself a bit better. Negotiation would be required. Many of our menu items are created by Chef alone. Creativity is often sparked after finding something particularly fresh or interesting in Kensington market or being tipped off by a supplier. Sometimes he is inspired by an article in his subscription-only, hard-cover cooking magazine: Art Culinaire. He will improvise a dish while staying true to the Beech Tree’s style, standards and food ethos. Other recipes grow out of conversations between him and me in the closed and empty restaurant late at night. These sessions are usually fueled by pints of beer along with a plethora of cook books scattered about the bar for inspiration. To the point, being summer, I dreamt of a dish that included glistening orbs of mozzarella di bufala. Resembling a soft poached egg, buffalo mozzarella is a wonder of texture and purity. The flavour is subtle, evoking the childhood nostalgia of drinking a glass of bland but reassuringly cold milk—or perhaps awakening something deeper and more primal; reaching far back to the memory of being a babe at the breast, fanciful, I know. Nevertheless, while the flavour may be simple and unassuming; buffalo mozzarella more than makes up for this fact with its silky creaminess. The milk of the water buffalo is much higher in protein and makes for a different, perhaps richer experience than standard cow’s milk mozzarella. This product has been available in Ontario for only a few years now. Previously, it needed to be imported from Italy. I wanted something on the menu which would include this mozzarella, but Chef bristled at the notion of a clichéd, so-called Insalata Caprese – simply put: mozzarella, basil and tomatoes arranged to resemble the Italian flag. As Balsamic vinegar surged in popularity in the 80’s and 90’s it started appearing on this salad in one form or another as well. Chef was right. It did not sound like something that we would serve in The Beech Tree, it’s just too…I don’t know…predictable, I suppose. He hated it. We are a team here, so I needed unanimity. I recalled reading somewhere, that in Italy, they sometimes serve massive globes of fresh mozzarella with a sort of murky anchovy vinaigrette and some blanched hearty greens. I really liked this idea of introducing salty anchovies to the simple, unadorned flavour profile of the mozzarella. I mentioned this to chef, and instantly, I had his attention again. We discussed the idea of combining it with a sort of panzenella, another Italian classic salad using stale bread that is soaked in ripe tomato juices and olive oil. 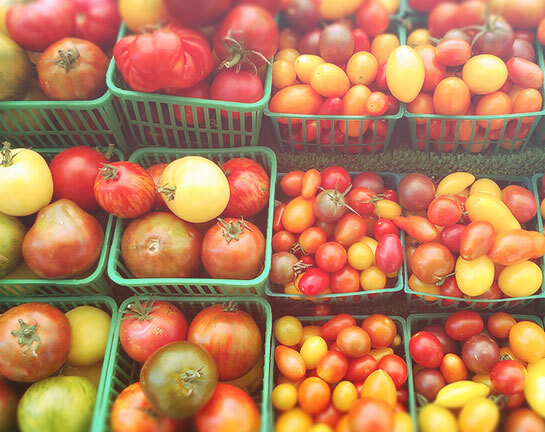 The tomatoes in Ontario were just starting to come in: fat, ripe, heavy in the hand and bright red. Toasted bread, tomatoes, buffalo mozzarella, anchovy, and chilies: now we were on to something. Are these flavour combinations earth-shatteringly original? No, but they are certainly good, and a bit more interesting than a clichéd tomato and mozzarella salad. So chef took the idea and ran with it. He developed two dressings to go with the salad. The first is a piquant pureed tomato condiment made with chillies, garlic and other flavourings. This is spread on the bottom of a chilled plate, cunningly hidden under the salad to surprise the diner with an additional layer of spicy tomato flavour and a deeper umami bass note. The second dressing is the high note, lighter; a punchy tomato vinaigrette. This vinaigrette picks up all the natural acidity in ripe tomatoes and would be the moistener to soften the bread component as seen in a panzenella. The buffalo mozzarella is marinated in oil and a chiffonade of fresh basil overnight—a subtle homage to the original (and much maligned) insalata caprese. Before serving, the mozzarella is pulled from the marinade, and plated atop the spicy tomato purée along with slices of several different varieties of heavily ripe Ontario tomatoes. The tomatoes and cheese are dressed with oil, kosher salt and freshly cracked roasted black pepper (at the Beech Tree, we lightly roast our whole black peppercorns before grinding in-house). The vinaigrette-soaked croutons are scattered about the plate. The salad is layered with a variety of Ontario organic micro greens (from Sleger’s Living Greens in Stathroy, Ontario), then a drizzle with a bit more of the tomato vinaigrette. Finally to come back to the original idea, a battered and deep-fried anchovy fillet, hot and crispy, is delicately perched atop the lightly dressed micro greens to finish the dish. This brings a new texture to the dish and makes for another layer of eating experience via temperature differences on the same plate. We play a lot with hot and cold combinations, and I think they are a wonderful way to excite the palate. There are few instances for which I like cheese and fish coming anywhere near each other, but this is one exception to the rule: mozzarella and anchovy. This kind of salad will come down to the quality of the ingredients and the balance of the flavour, so it is critical that we use the best, ripest local tomatoes. It is a truly seasonal dish; these flavours could not be properly replicated with insipid and pale winter tomatoes. In the end, Chef came around to the idea of a mozzarella salad, but like many of our dishes, things need to be done right and by exacting standards. A little bit of research and development is often required, and dare I say, “negotiation” before anything ends up on our menu here at the Beech Tree.